The Wedge's "Endless Sun" has long been a fave of mine. This is the second release from this band, and the first full length. It includes a few priceless vocals that are more to the point of the lifestyle than even the Surf Punks. "Drink (Hoouh! ), Party, Forget" and "Liquor Store" are perfect slabs of surfer society. Some one needs to release all of their work. How 'bout it, Rhino or Dee-Gee? 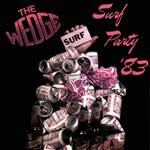 This cover of thee surf archetype is updated with intense eighties flair and a chromium tone. It's dynamic, smooth, an more than a little infectious. It uses the tone as a major element of the vehicle, and it is an original arrangement. Very strong. Rhythmically surfy, nicely arranged, and very solid. great glissandoes, a chunky backtrack, and a magnetic energy. This reminds me somewhat of a surfier, more artful, and slightly more subdued "Shore Break" (Tommy & the Piers). Yes, this really is an instro version of the XXXXXXXX top 40 hit. It's very big and dramatic, while being entirely playful... oozing disco-isms and the Wedge's signature sound. Too funny. This fine tune lies somewhere between spaghetti western and the Shadows. It is melodic, well crafted, and memorable. It's slightly mean, yet friendly enough to keep close at hand. A very nice track. Clumpy intense surf moderne... The backtrack builds to a crescendo so that the lead can fly off on summer curl. The melody is interesting, while the backtrack seems very polished, almost "commercial." Another modern anthem, "Crescent" is thoroughly post surf in structure, yet laden with glissandoes. The heavy beat that shows its head in places counters the otherwise frothy sounds. Rhythmic and visual. The Mar-Ketts' "Balboa Blue" is given a whole new life. In some ways, it's a modern version of the studio froth Joe Saraceno created, and in others, it's authentic 80's surf. I can't decide if I love it or hate it... ah controversy. Crisp ringing moodiness, a mid tempo floating melody a la Summer Place, and a beefy sustained guitar distortion... it's a meaty summer breeze kinda track.